This 4ft Small Double Divan Bed Base is finished in a White Damask fabric. 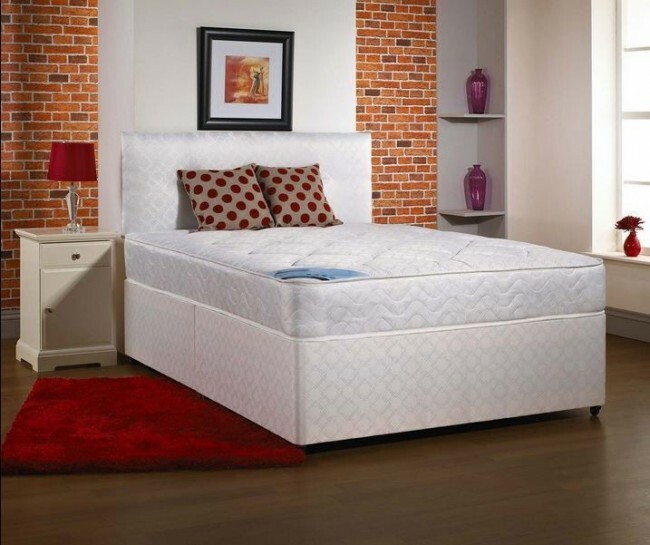 It is delivered in two halves and comes with castors and attachments for a headboard. Requires simple assembly by way of a clip to join the two halves together. No extra tools are required. You can have storage drawers anywhere on the bed base. Drawers will be wooden drawers upholstered in a matching damask fabric to the rest of the bed. We can also supply this divan bed base with customized size and storage options of your choice. Please Contact Us to discuss your requirements. Note For this item Postcodes AB, IV, PA, PH, KA, KW, KY, DD, DT, TQ, TR, EX, PL, LL, LD, SA, NR, IP, TN, NPwill incur an extra £25 Delivery charge.